Author of seven picture books, including More Than Enough: A Passover Story (Dial), It’s Not My Turn to Look for Grandma! (Knopf), and New Year at the Pier: A Rosh Hashanah Story (Dial), named Best Jewish Picture Book and winner of the Sydney Taylor Gold Book Award. Ms. Wayland won the Myra Cohn Livingston Award for Girl Coming In for a Landing: A Novel in Poems and has won seven poetry awards from the SCBWI. 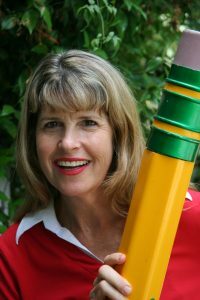 She is a recipient of the UCLA Extension Outstanding Instructor Award in Creative Writing. The picture book, to me, is a miracle. It is the pairing of two worlds, the visual and verbal, to make an entirely different art form. Our art is in the language, the humor, the respect for our audience, and in the cutting away of all unnecessary words. We only get 650 words—850 max—to create the atmosphere, define characters, tell the story and get out. The energy in my classes runs somewhere between worship and exhilaration. Somewhere between voices singing the Messiah in an old church in England and six-year-olds jumping up and down and talking really fast because someone put a grasshopper in their pants and because it is so damned exciting. And it is exciting—to be on this road doing this thing, writing for kids. What could be more terrific than writing a picture book? Instructor Website: Click here to leave our website and go to April’s website.